The site of St. Mary’s was originally Glebe land and, in the mid-19th Century, it was given to the then Parish Church of St. Lawrence for a burial ground – this was before the road existed. The new church of St. Mary’s was built on the site to cater for the growing population. A 1955 survey indicates that very few burials took place before the new church was consecrated. 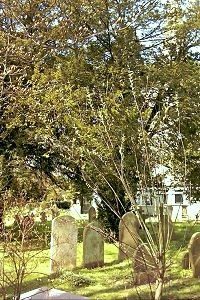 However, in the next forty years the graveyard filled rapidly, and there were again relatively few burials after 1900. Not much is known about the next forty years. During and after World War 2 the site was neglected and became a tangle of brambles and nettles. The story goes that Londoners got on their bikes to come and pick the blackberries! A Mr. Bill Ottaway then worked hard for many years, restoring order and planting and caring for roses near the Guardsmen’s graves. The garden shed was virtually his second home. By 1990 his health was failing and in 1991 a small group took on the area to the east of the Chancel. Ironically, just after clearing the protective screen of brambles, the church was burgled several times. This area was then developed as a garden area with grass paths, shrubs, perennials and, of course, tombstones! 1994 brought some ambitious changes. It was agreed to develop all the southern area of the site for conservation. A number of dangerous conifers were felled, and the whole area was cleared. A planned planting session took place in 1995: native trees, shrubs and flowering plants were laid between islands of long grass and wild flowers. Mown paths led one through the whole garden. Amazingly, most of the money for all this work came from personal donations and fund-raising events. Some funding was also provided by Tandridge District Council and the Shell Britain Campaign. 1996 brought the introduction of the Garden of Remembrance, in response to an identified need for the Interment of Ashes. The next big milestone was the Millenium. To celebrate this event, a yew tree was planted on the East boundary. It was rather fun since this tree was propagated as a cutting from one of the existing trees in the church yard, so its genetic material was already 150 years old! 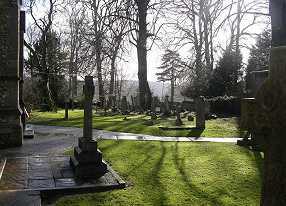 The work in the churchyard, as in any garden, is on-going and we have a great team of volunteers. They work alternate Saturday mornings for, as all Alan Titchmarsh fans know, a wild garden is not a neglected garden. 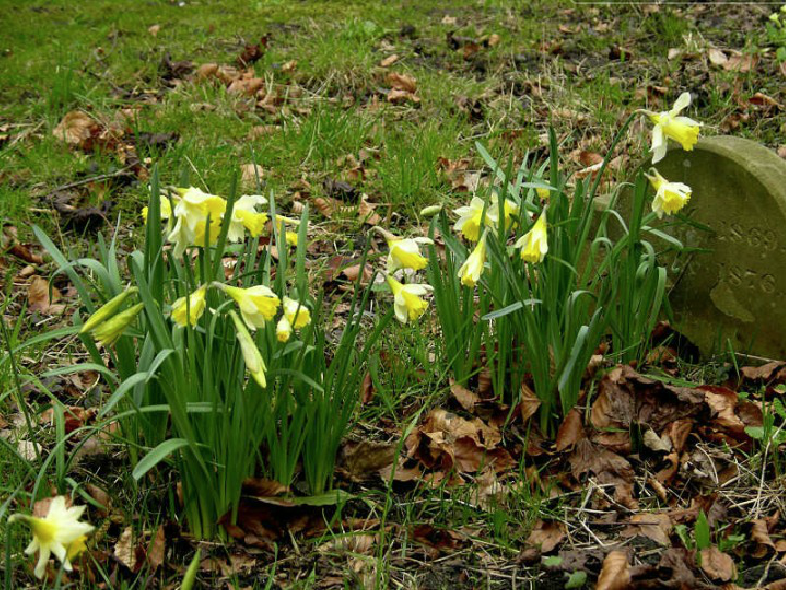 There are many types of flowers in the churchyard, both wild and cultivated. You can see below, a photo gallery of the spring flowers. If you wish to know more, or would like to join our team, contact the Churchyard Conservation Group through John Gilbert (01883 340115) or via the contact us page. A churchyard is not a nature reserve . . . Its prime purpose is not the preservation of wildlife. 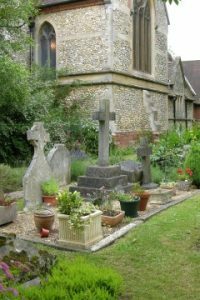 However, there is no doubt that many churchyards are enhanced and made more enjoyable places to visit by the presence of wildflowers and butterflies. Much of St. Mary’s churchyard had become a wilderness of brambles and nettles before the churchyard working party started to transform it some years ago. Brambles and nettles are, in fact, a good habitat for wildlife, but they create an air of neglect and are totally unacceptable when they block up paths and obliterate graves. 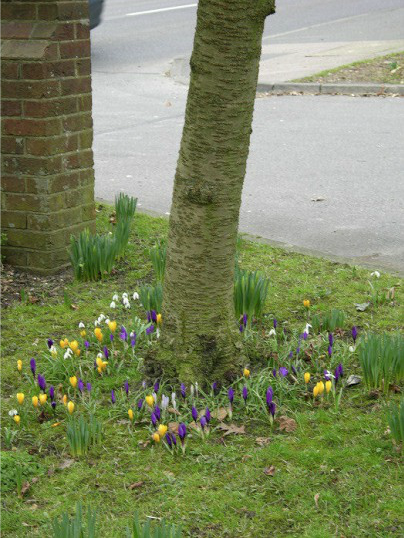 One of the aims of the work in the churchyard is to encourage wildlife, but without letting the plants get out of hand. One of the ways this can be done is to allow islands of grass and wild flowers to grow, with mown paths around them. These can be managed like miniature hay meadows, being rough-cut after flowering. 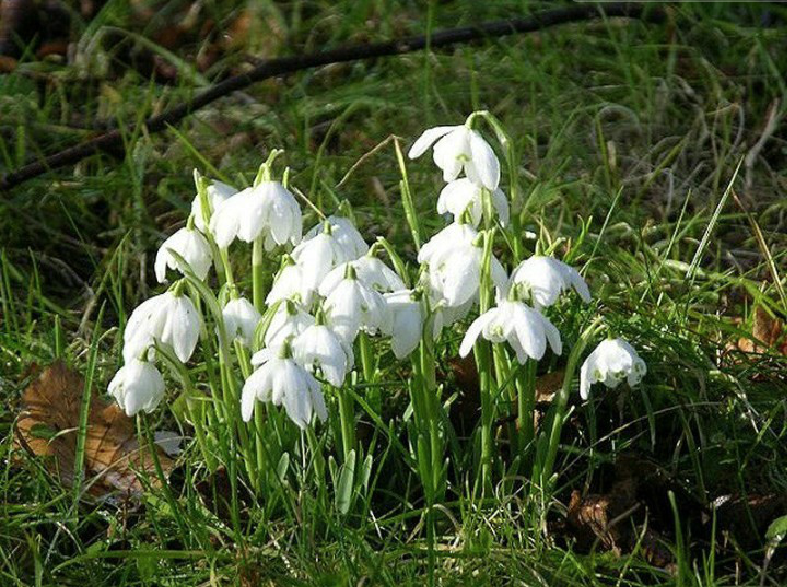 This provides ideal conditions for many wild flowers, some of which have appeared in the churchyard naturally and some of which have been introduced. Cutting prevents the grass from swamping the flowers and checks the return of nettles and brambles. Because of these grassy islands we have a number of butterfly species resident in the churchyard: Meadow Browns and Gatekeepers lay their eggs on the grasses: Common Blues use Birds Foot Trefoil. Other Butterflies will visit us from elsewhere to feed on the nectar of the flowers. Trees and shrubs provide a completely different habitat. A variety of birds are attracted to different nesting sites and food sources. Hips, haws, and elderberries are important food for birds in winter so native trees that produce these are grown. They can be coppiced back when they get too large and bushy young growth provides shelter for birds and small mammals. Another important shelter plant is ivy, the flowers of which give nectar for many insects when there are few other flowers around. The flowers for the formal parts of the churchyard are, of course, another attraction for insects and birds. 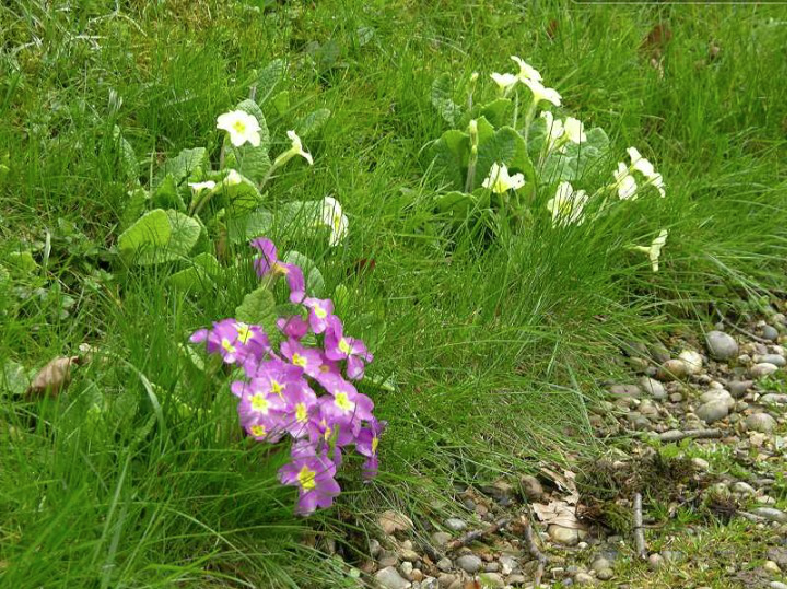 The key to success is the variety of habitat that even a small churchyard can support. Trees, bushes, grass and flowers all play their part. It is surprising how many different types of flowers and insects can be spotted in the churchyard during a half-hour stroll on a sunny summer afternoon. It is a very pleasant exercise.